There are plenty of refrigerator makers out there, but only a small number of them are reputable outdoor kitchen fridge makers. How do you go about identifying the best outdoor refrigerator brands for your outdoor kitchen? A basic search online will turn up either the most commonly purchased, or the most aggressively marketed. You might miss out on a few better matches for your needs. While each category can be considered a separate list of refrigerator brands, many of these brands have a range of products that will span two or more of these categories. So, I've listed them based on the reputation for the majority of their products, and included all three categories on one page for comparison. If you've spent any time in commercial or luxury outdoor kitchens, you will have seen at least one of these high end refrigerator brands. They are built to be longer-lasting, with more stylish finishes (customizable panels like wood) and superior materials, and operate reliably in hotter temperatures. Outdoor high end refrigerators include all the bells and whistles you've come to expect from luxury refrigerator brands: temperature alarms, glass doors that reveal the contents at a glance, colorful mood-setting lighting, dual cooling zones, and more. Hestan went from pioneering nonstick cookware in the 1970s, to commercial kitchen inovation. Those innovations allowed the Hestan team to move to outdoor cooking (originally more of a commercial endeavor), and then, into the home kitchen. Those first commercial kitchen designs show in how their outdoor refrigerators cater to an upscale clientele. Heavy-duty insulation, stainless steel front, sides, and interior, convertible door design allowing for wood overlays, locks, and zero clearance hinging. Their dual zone Refrigerator offers two independent temperature zones so you can store both reds and whites at optimum temperature. Full-extension wine racks keep your wines safe from vibration while the UV-coated glass door keeps out harmful sunlight. With more than 125 refrigerators designed for outdoor use, Perlick Corporation is dedicated to providing innovative, quality customizable food and beverage storage and serving solutions. Perlick is known as a national manufacturer of commercial bar and beverage systems, and brewery fittings, as well as residential undercounter refrigeration. Perlick brings its commercial-line quality to its residential and outdoor refrigeration lines, and has become somewhat of a designer’s favorite for outdoor applications. Commercial-grade stainless steel interiors and exteriors make for a more sanitary, easily cleanable, and durable surface, keeping contents cooler than those refrigerators with plastic liners. Glass doors add style and convenience, while heavy duty, full-extension drawers and shelving provide for durable and easy access. At over 125 years old, Marvel Refrigeration is the oldest refrigeration company in North America. They pioneered the first built-in unit with a glass door and stainless steel interior, and the first wine cellars and beverage centers with black interiors. Marvel offers an extensive product line of undercounter outdoor refrigerators, ice makers, and beer dispensers, with a variety of shelving configurations, size options, and finishes. Certified for performance to withstand the elements, Marvel's Outdoor Series refrigerators are built with commercial grade stainless steel that's been salt spray tested for corrosion resistance. Rugged designs feature full length handles and toe kicks for a professional-style outdoor kitchen. When this younger company got started in 1996, Lynx Professional Grills was committed to outdoor cooking at a time when outdoor cooking meant “barbecue grills”. Since then, the trend became “outdoor living”, and Lynx repositioned itself to fulfill the demand for luxury outdoor kitchens. The founders took their experience manufacturing stainless steel products for the commercial restaurant industry, and incorporated the same high standards of materials and craftsmanship into their collection of luxury outdoor kitchen products and accessories, so that they can endure extreme weather conditions, and stand up to heavy use and the test of time. Close door assists, door and temperature alarms add to the durability and style to complete the luxury experience. Founded in 1969, Summit Appliance supplies refrigerators, freezers, and cooking appliances for commercial, professional, foodservice, medical, and specialty applications — known particularly for catering to small or unusual spaces. They carry a huge selection of appliances in hard-to-find footprints, including under-counter selections in 12, 15, 18, 20, 24 and 30 inch widths. And, although this selection includes over 600 basic models of specialty refrigerators and freezers in their residential and professional lines alone—which include weatherproof outdoor appliances—they often customize their products for both style and function, changing the exterior appearances to match homes, offices or institutional settings; Even modifying dimensions to fit unusual spaces. The weatherproof selection is constructed inside and out from 304 grade stainless steel, ensuring a lasting durability and protection from the elements. Available with a variety of handle styles, and even drawer styles, they feature stainless steel construction, digital thermostats, and LED lighting. This is what I would consider the average price range of standard outdoor refrigerators, as I'm sure your own shopping research will confirm. As I mentioned earlier, many brands span two categories, and you'll see some of the brands above with models in this category. Some of these brands below will also have a model that will cross into the high-end category. But, for the most part, these brands fall into the standard price range and features for the average outdoor refrigerators. Since 1962, U-Line has been a leader in premium modular ice making, refrigeration, and wine preservation, serving the residential, outdoor, ADA height compliant, and marine markets. Their durable outdoor models are UL rated for outdoor use, and are fully wrapped in stainless steel to protect them from the harsh elements. The Outdoor Series includes solid-door refrigerators, as well as drawer models, clear ice machines, and crescent ice makers. U-Line utilizes a modular approach to food and beverage preservation, offering a flexible design solution, with flexible capacities and seamless integration capabilities, that allows you to “design your kitchen around you, not your refrigerator”. Based in Dallas, Texas, Coyote Outdoor Living specializes in the design and production of a number of high quality outdoor culinary & kitchen equipment, and entertainment products. 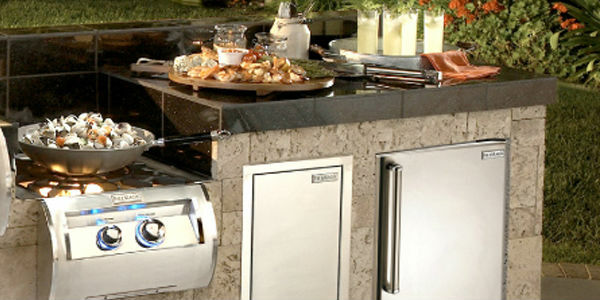 As with their grills, their refrigeration products are built with premium grade 304 stainless steel exteriors, and include refrigerators, a drop-in cooler and full extension pull-out cooler, and a full refreshment center complete with cooler, sink, condiment tray, cutting board, towel holder, and bottle opener. Fire Magic is a subsidiary of the RH Peterson Co. — a company dedicated to manufacturing grills and gas logs. Already having a strong foothold in the outdoor cooking industry, with over 80 years experience building outdoor grills, they readily expanded into the outdoor entertainment trend. Fire Magic has a complete line of outdoor kitchen accessories from side burners to refrigerators, including ice makers, refreshment centers, and even a blender. EdgeStar has been an industry leader in the specialty appliance field since 2004, developing a selection of compact appliances designed for recreational vehicles, boats, yachts, small apartments, weekend homes, or small offices and businesses. Many senior citizens and disabled people have found that these products are efficient and easier to use. Their outdoor refrigerators are fully encased in stainless steel, to handle the elements in outdoor applications, such as an outdoor kitchen, bar, or garage. Avallon is an appliance development venture of EdgeStar that provides wine coolers, beverage coolers, and outdoor refrigerators. Their business model focuses on delivering quality luxury-designs at a good value. By minimizing additional features, and concentrating on customer convenience and appliance functionality, they deliver on a luxury look at a more affordable price. Avallon refrigerators feature a professional looking seamless stainless steel door, a digital touch panel for convenient control, anti-vibration gasket undisturbed beverages, and a carbon filter to block unwanted odors. Optional blue LED internal lights add to the deluxe look. A leader in the wine storage industry, Vinotemp has been building premium wine cabinets for over 30 years. They have been a full-service manufacturer and distributor of custom wood wine cabinets and racking, cooling systems, and quality metal wine cellars since 1985. Vinotemp specializes in custom wine cabinetry, racks, rooms, and cooling units. From countertop coolers to floor-to-ceiling glass commercial cabinets, Vinotemp products can be found at many of the finer hotels and restaurants. But sometimes you just want to pick up a cheap outdoor refrigerator that will simply function outdoors properly—perhaps even short-term—without too many bells and whistles. This is where the budget brands come in. Some of these brands offer full-functionality at an affordable price point, while others offer basic functionality as low as the $200~$300 price range. Popular and reputable, they are all worth a look. For over 65 years this family-owned business has been creating appliances with “big product features” designed for small spaces. From refrigerators and beverage centers, to air conditioners, kitchen appliances, and laundry machines. Danby's outdoor refrigerator, tested for its cooling capacity and rust resistance in a tropical environment, is made for durability in exterior conditions. It offers “big fridge” functionality such as door storage, crisper drawer, ice bucket, adjustable shelving, and even an integrated lock, all at an affordable price. Blaze Outdoor Products focuses on creating the appliances you'll need to stock your outdoor kitchen. From grills and burners, to refrigerations, drawers, and other accessories—their mission is to completely furnish your outdoor kitchen and living space without you having to break the bank. Their outdoor refrigerator line goes from a very basic standalone model, to a sleek built-in model wrapped in the outdoor standard 304 grade stainless steel, which matches the rest of their outdoor product line. They also feature special beverage racks and door locks to keep contents convenient and safe. Bull Outdoor Products Inc. began in 1993 with a focus on furnishing the outdoor kitchen. 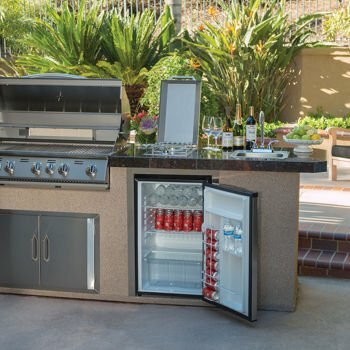 Better known for their award winning grills, Bull makes a wide variety of outdoor kitchen appliances and tools including islands, carts, pizza ovens, fire pits, drawers, and furniture. Their outdoor refrigeration line includes a “kegerator”, a standalone model, and a premium built-in model, all of which will work on a budget. They match the same stainless steel look of their excellent grill line to maintain a consistent look in your outdoor kitchen. It's hard to make a list of the best refrigerator brands that will appeal to everyone. The best outdoor refrigerator brands may differ from person to person in order to cater to everyone's specific needs. The list I've created categorizes those needs based on class. It's a basic refrigerator brands list, but growing. I'd like to expand it to be more representative of the best outdoor refrigerator brands available. Is there a brand you love and respect that is not represented here? Or a category of brands that might make more sense? Please let me know. Put it in the comments below, tell us why, and let's discuss. I personally like marvel . its lasted me forever and wasn’t as expensive as some of these other brands.